If you’re considering installing an intercom system in your property, you are making the right steps in protecting your home or business. Intercom systems are the perfect way to secure the home from theft and to protect your family and your valuables. You’ll now be able to talk to the person at your door before you even open it and in some cases, even see them too. With these 5 different types of intercom systems, you’ll have all kinds of options to protect your home in the way you need most. Take a look at the various intercom systems available. A wireless unit is a newer take on the original hard-wired intercom system. The wireless intercom uses a different type of radio frequency and tends to be less expensive than other options. There is basically no installation required which means you can start using them right out of the box. Just make sure the battery is up to date and be aware of the range of a wireless unit. While these are convenient to install, they can sometimes have interference issues and a lack of a wide range that you may need. In some cases, an unauthorized person could potentially tune-in to your frequency. With the ease of use and the low price point around $100-$200, it’s a great option to consider. The most common intercom option is going to be the hard-wired unit that you can mount inside the home. These work by allowing you to communicate with someone at the front door just by pressing a button to speak and then your intercom speakers are connected by wire in the home. You may pay a little bit more for this type of unit, but it’s much more reliable in avoiding external interferences and handling more wear and tear. The audio signal works well, making communication much clearer and you can worry less about if your property is protected. If you are in the middle of construction on a building, it would be very simple to set up a wired unit. Talk to a professional about getting this installed. Another option is to get a video intercom. This is for homes that want the option to see a visitor that is at the door before communicating with them. They are typically going to be wired systems since video is more difficult to send wirelessly than an audio-only system would be. You can also go for smart home technology that will allow you to incorporate a camera into your intercom system. You’ll be able to connect your devices and appliances to the internet to give you functionality of your home’s processes from your device. You could use a smartphone or tablet to lock the front door, turn off the lights, or change your thermostat. This means that you can also incorporate a webcam to your front door that can be accessed with your other smart home technology. You will have to have a good internet connection to do this successfully and it does have the potential for hacking vulnerability, but you have remote access. A carrier-current is an intercom that would be integrated into the electrical system of your home. This is another frugal option for an intercom system where you could have a conversation with someone at your front door. It’s easy to install and maintain but you may find other options provide better audio quality. Do you have many visitors and hate to have to stop what you’re doing to let them in? Now you can use the automatic-gate entry intercom to let people into your residential front gate without being physically present. Just press the button to let them in the door. In many cases, you’ll have a small camera at the gate to be able to see who is at the front gate. You’ll be able to see, talk to, and open entry for a visitor from inside the home. These five types of intercom systems are great additions to your home office. Having a good intercom system is vital to some types of properties. For others, it's a nice convenience and can make life easier. However, intercom systems can often need repairs due to specific issues. There are some issues that are more common than others. Let's look at three of the most common repair issues found in intercom systems. It's not uncommon for an intercom system to end up with static from the microphone or the speaker. Static can be caused by many different parts of the audio equipment. Regular wear can cause static due to a bad connection. This could also cause the intercom to simply not create any sound. Usually, static is noticed before the intercom completely stops creating sound. Any type of damage to your intercom system can cause static within the system. It could be caused due to a loose wire or a bad switch. Another common cause of static is interference. Even on a closed system, an intercom can experience static from interference. The power connection can also be a source of static. Any problem with the power connection may cause static throughout the system. This could be a sight of a larger issue, too. Sometimes, a power overload or a shorting may cause static and if it's not repaired, it can cause major damage to the system. 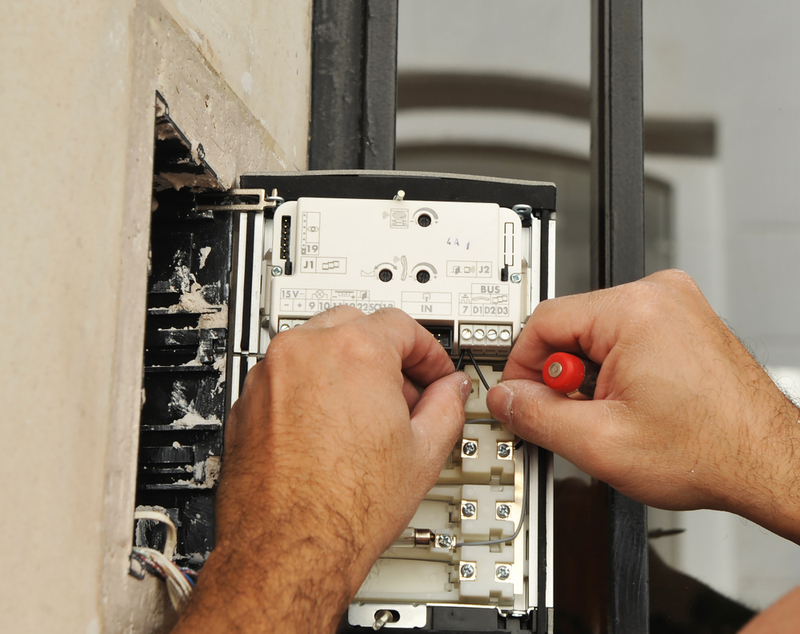 If you've noticed static within your intercom system, it's time to hire an intercom repair professional. Another common issue with an intercom system is a humming noise heard when trying to use the system. This could be a sign of something worse and needs to be addressed immediately. It could be due to a faulty wire or connection and repair is necessary to keep the issue from getting worse. While a humming sound may be annoying, some will just live with it and think very little of it. However, it could be a sign of something worse. When left unaddressed the issue may get worse and you may end up with an intercom system that doesn't work anymore. As stated above, static within your intercom system may be a sign of a larger problem. One of those larger issues is a power supply failure. When the power supply starts to go, it could cause other issues, such as static or even humming within the system. Of course, if the power supply stops working, the intercom system will also stop working. Most intercom systems will show signs of the power supply going before it actually goes, however. Hearing more background noise may be another sign the power supply is starting to go. The best way to address any intercom issue is to contact a professional intercom repair company. You want to choose a company with plenty of experience with your type of intercom system. Every system is a bit different and a huge part of fixing the issue is the proper diagnosis. The right repair company will be able to diagnose the problem and get it fixed quickly.